Great for FOAM PARTIES, otherwise don’t waste your time! Found out there is going to be a recall on these things, so don’t buy one until Krups puts out their version 2.0! My Uncle-in-law is the beer distributor here in the city I live in and I called and asked him why these things foam up so bad. He said he talked to the Heineken vendor and he said they gave a bunch of those BeerTender’s away to distributor’s (including my Uncle) when they first came out and every one of them ended up in the trash. So Heineken is jumping down Krup’s throat to fix the “FOAM” problem. I guess Heineken poured millions into the technology and they are pissed because their reputation is going in the toilet over a product they thought was going to put them back on top in the US. Prior to finding out how bad this product is, when Linens & Things went out of business last month (12-08) I picked up a couple of “BeerTender’s” on closeout for 83 bucks each. I bought a 5L Heini mini-keg for 20 bucks and was ready to try it. I followed the video directions at Krups’ website on how to use it. I rinsed a glass out with cool tap water, angled it perfectly and pulled down the tap… Nothing but Foam! This happened with every glass I poured. I bought a Heineken Light keg and had the same problem. Plus, just like Joel Johnson mentions in his above posted review, the LED gauge on both of my BeerTender’s don’t tell you when your keg is empty like they are supposed to. It shows a green full light from the beginning of the keg until it’s empty. Krups definitely needs to go back to the drawing board and re-tool this product. Maybe they can call the Windows Vista guys and see how they did it. Until then I’ll just go to my buddy’s house and enjoy his EdgeStar Mini Kegerator and some Warsteiner. Oh and P.S. everyone’s asking if you can use other 5L mini kegs in the BeerTender. The answer is NO. 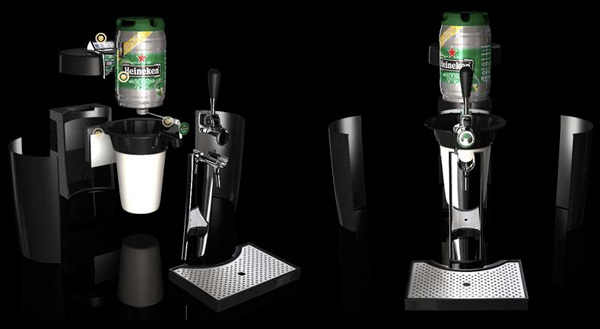 Only Heineken products work in this beer-tap system. Maybe they will address that in the recall too. 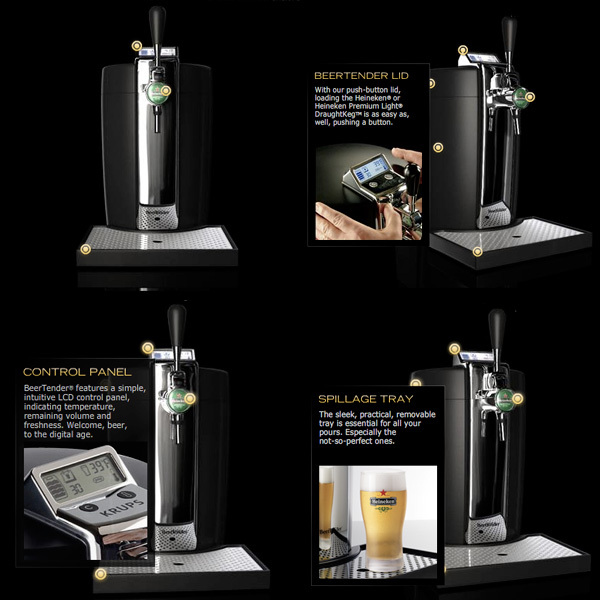 Will this tap system work for other minikegs or ONLY Heineken? I played with one of these a while back. It certainly LOOKS sharp and was well made. And it does in fact pour beer…albeit it out of a container that already poured beer by itself. I guess it makes you look cooler pouring the beer. Not sure who would buy one though considering the alternatives are generally cheaper, easier and offer a limitless selection. It’s kind of like buying a single flavor Pod coffee maker in lieu of having a starbucks in your house for the same price. Mark, no worries, i need more of “that guy” around the sites anyhow! Perfect draft looks pretty sweet! I just liked the instruction graphics and 3D view of the insides… as well as that age verification splash page, it was an interesting UI. Not wanting to be -that guy- but this has been around for almost three years now. It uses about the same amount of energy to keep your beer cool as three complete combifridges and it tastes awful. For the real deal, check out Philips’ Perfectdraft(.com)!